Check out the 4th episode of the Official MDMC Podcast: Marketing Leaders Insights and Advice! 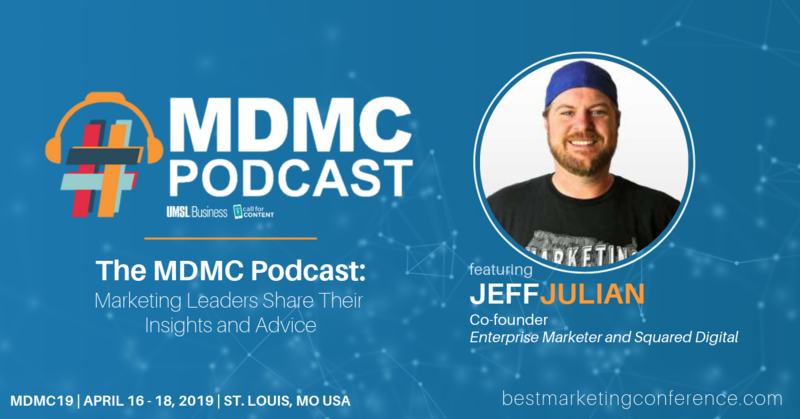 This podcast series features UMSL College of Business Administration students interviewing many of the amazing speakers from #MDMC19 about the latest digital marketing trends, career tips and more! Jeff is the Chief Executive Officer of Squared Digital and Co-founder of EnterpriseMarketer.com. He has been helping companies develop content strategies for over ten years, after launching one of the largest blogging communities, Geekswithblogs.net. He’s been a web developer since 1994, and a Microsoft Most Valuable Professional in XML and SharePoint. He is also the best-selling author of a book on SharePoint development and Jeff recently published a book titled, Agile Marketing: Building Endurance for your Content Marketing Teams. Listen now to learn more, and make sure to subscribe so you don't miss out on future episodes! We want to give a big shout out to the fantastic producer of the MDMC Podcast Michael Greenberg, Chief Strategist and Interviewer at Call for Content, for not only producing the podcast but sharing his podcasting expertise with the UMSL Business students.